It’s a nice problem to have, when combined vertical and horizontal growth from new and expanding markets leaves a manufacturer wondering how to increase metal-fabricating capacity from its existing shop-floor space. Faced with just this opportunity (and challenge), irrigation-systems manufacturer Lindsay Corp., near Omaha, NE, found the solution with a new higher-capacity laser-cutting system (a model CL-850 from Cincinnati Inc.) combined with a dual-pallet work changer. cutting machine at Lindsay Corp. has doubled productivity compared to the firm’s previous laser-cutting machine, and processes primarily mild steel to ¼ in. thick. The machine features two 6- x 12-ft. pallets and pallet change take just seconds, enabling nearly nonstop cutting. Faced with accelerated growth from its expanding business lines, Lindsay engineers recognized the need to significantly increase throughput and the efficiency and flexibility offered of its sheet- and plate-fabrication department. The company processes steel from 20 gauge to 0.75 in., while the CL-850 (5000-W) is rated for mild steel to 11⁄8 in. “The new laser-cutting center provided just the increase in speed and thickness range we needed to accommodate the growth we were experiencing,” says manufacturing engineer Jim Belzer. “The laser doubled productivity compared to our previous machine and allows us to cut plate to ¾ in. (compared to ½ in. before) and process plate that we used to plasma cut. “The laser is much faster than plasma cutting, plus it gives us superior edge quality,” Belzer adds. 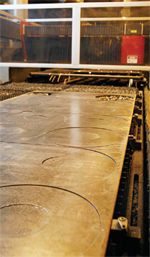 Plasma-cut plate typically requires post-process deburring or machining, adding throughput time, labor cost and more complex work scheduling. Meanwhile, the laser system’s cutting head features AutoFocus lenses of 5-, 7.5- and 10-in. focal length. The lenses allow the focus points to be instantly adjusted between piercing and cutting, for optimal processing. For example, Belzer notes that processing time has dropped by more than half, when fabricating galvanized steel for irrigation-system control panels. Laser cutting eliminates hard tooling for such parts, which have a number of cutouts, he says. Also helping to slash processing time is the addition of dual quick-change pallets to the laser-cutting system, which enables an operator to load and unload pallets offline while the system cuts work on the second pallet. The CL-850 features two 6- x 12-ft. pallets, compared to the single 5- x 10-ft. cutting table on Lindsay’s older laser-cutting machine. In all, the new machine processes several hundred different part numbers, primarily mild steel ¼ in. and thinner. Lindsay machine operators program parts and jobs, a process that begins by downloading AutoCAD drawings directly from the mainframe to the laser. Cincinnati’s nesting software then is used to batch parts for optimum material yield. Article supplied by Cincinnati Inc., Cincinnati, OH: 513/367-7100; www.e-ci.com.